VANCOUVER (Reuters) - Canada's Alberta province on Monday edged closer to cutting off fuel shipments to neighboring British Columbia in an escalation of a row over the stalled C$7.4 billion ($5.9 billion) expansion of the Kinder Morgan Canada Trans Mountain pipeline. The project has pitted Ottawa and Alberta against British Columbia (B.C. ), and could turn into a constitutional crisis, derail Prime Minister Justin Trudeau's energy strategy and dent business confidence. 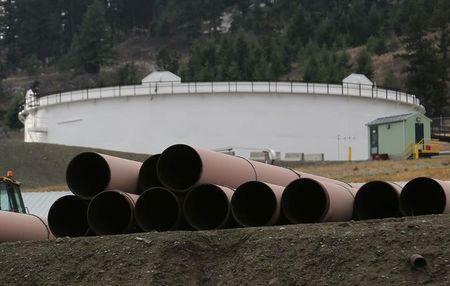 Kinder Morgan said earlier this month it was halting most work on the Trans Mountain expansion project, which was approved by Canada in 2016 but has been beset by legal tussles. The expansion of the pipeline, which extends from Alberta to the B.C. coast, is desperately needed by oil-rich Alberta, which wants to export more of the crude it produces. But it is vehemently opposed by B.C., which has pledged new environmental rules and a legal challenge, putting construction at risk. Seeking to put pressure on its neighbor, Alberta introduced legislation on Monday that gives it the power to control what products flow through export pipelines, allowing it to prioritize more valuable crude oil shipments over refined fuels, like gasoline. That could hurt B.C., which uses Alberta's refined fuel. Trans Mountain is the only pipeline in North America that carries both crude and refined fuel products. "We did not start this fight, but let there be no doubt we will do whatever it takes to build this pipeline," Alberta Premier Rachel Notley told reporters. B.C. environment minister George Heyman said in response that his government was "prepared to defend British Columbians' interests with every legal means available." On Sunday, Trudeau pledged financial aid and said his government would draft legislation to reaffirm federal jurisdiction over the issue. Those measures have the aim "of making sure that one, that this pipeline will be built and two, that all of the investors involved know that we take this seriously and they can be confident it will go through," said a source close to the government on Monday. Kinder Morgan Canada's shares closed up 13 Canadian cents at C$17.37 on the Toronto Stock Exchange. Under the new legislation, Alberta can ask companies exporting energy products to seek a license, allowing the government to impose restrictions on transport by pipeline, rail and truck. The province will only enforce the new rules if deemed necessary and any move may be tied to the outcome of a planned May 31 decision by Kinder Morgan on whether construction will go ahead, Notley said. Aboriginal and municipal leaders held a news conference in the B.C. port city of Vancouver to reiterate their opposition to the project, which they say poses a grave environmental risk. "They can call in the Canadian army, ok, I'll stand in front," said Amy George, a First Nation elder. "I'm going to stand up for my grandchildren, for my waters, for my land and for my air."